We've already seen a few racing titles released on the WiiWare service, although, to be fair, many of them have been fairly substandard. So any time a new racing title is released, it's generally met with not only a small degree of anticipation, but also a solid helping of caution and scepticism as well. Stunt Cars brings yet another racing title to the WiiWare service, but tries to do so with a few gameplay twists here and there. Unfortunately, the game never seems to feel like it knows exactly which direction it wants to turn and ultimately ends up feeling more tedious than fun. 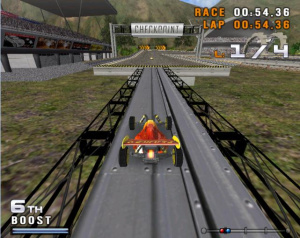 If you tackle the game as a single-player experience you can do everything from race in the game's Championship mode to merely taking a few spins around a specific track in a Time Trial. Championship mode will take you through the game's various racing cups, each with four tracks that you can take on in either the intended order or a random order if you so choose. This is a good way to earn driver's points and increase your ranking. Time Trial allows you to race a set number of laps around a track in order to achieve the fastest time for that particular track. You can even race against the Replay Car of the current fastest time to gauge your progress. If you can round up a few friends, you can also take on one of the game's multiplayer modes. 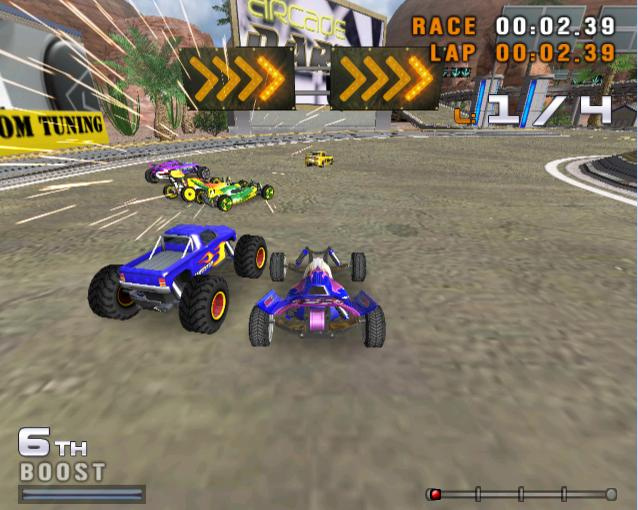 You can choose to go head to head with up to three other players in a split-screen race or even race in a two-on-two Team Race if you have four players to hand. There's also the Tournament mode, which is honestly the meat of the multiplayer action, and allows all players to race the game's main set of races and compete for the highest score. While the single-player mode might be fun for those who don't have other players around to play the game with, you'll get far more enjoyment out of the game if you can round up some additional players. There are several ways to control your car, depending on your particular preferences. You can use the Wii Remote by itself in either a sideways position using the D-Pad or setting the game to control via the Wii Remote's tilt function, which will also allow you to use the Wii Wheel if you prefer it. You can also connect a Nunchuk and use its analogue stick to control your car. The control setup is fairly standard with one button to accelerate, one button to break or go in reverse and a turbo boost that you can use to catch some big air off of the the game's many ramps. You can even pull off a small variety of stunts, although they don't feel like they really belong in the race and tend to slow you down more than anything else. The real problem lies in the game's somewhat loose control, and adding in the tilt function only seems to make the matter worse at times. You're honestly better off sticking with either the D-Pad or analogue stick to control your car, at least if you plan to stay on the track and compete with the other racers. Even with the impressive set of racing modes and the dozen or so achievements that can be earned, Stunt Cars' gameplay system just feels a bit thrown together at times, and the erratic AI doesn't help matters. It's not only frustrating to have to wait as the game picks you up and places you back on the track each time you make even the slightest movement off of the track, but it generally takes you from first place to dead last for even one misstep on the track. Multiplayer tends to help matters a little bit, but even that can be a battle of wills since one mistake can put you so far behind that it's difficult to catch up. 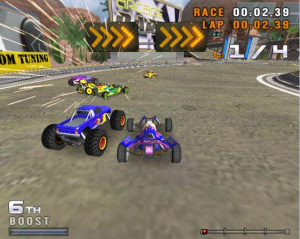 In the end the game could have used a bit more balance and a tightened-up control system in order to be the playable racing experience fans of the genre expect. Even with all the bells and whistles, the game still proves to be extremely bland in both its style and execution. The visuals in Stunt Cars are a mixed bag. While there are moments where the game's graphical presentation shines, there are far more times when the grainy visuals seem to stick out with their lack of polish and inherent amounts of flickering. Even the textures of the tracks tend to be very generic and seem like the same few pieces of texture repeated over and over. The cars themselves show a decent amount of detail and movement, but it's still not enough to ultimately cover up many of the game's other visual shortcomings. While the game tries to be visually flashy at times, it just doesn't have the smoothness gamers tend to expect from a racing title. The musical score of the game is much like the visuals: it never seems to get off the ground. There are a few catchy tracks in the soundtrack, but many of the musical tunes just don't feel like they belong in a racing game of this type. It doesn't help that the game doesn't make use of many sound effects, with even any type of car acceleration sound effect either missing or being completely overshadowed by the game's musical package. Toss in a game announcer that pops up only long enough to shout out a word or short phrase here or there and you pretty much have the entire audio presentation of the game in a rather disappointing nutshell. 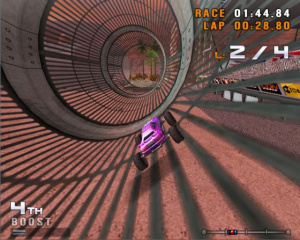 Despite the game's name, there is very little emphasis on actually performing stunts in the game and to make matters worse, what racing action there is tends to be very basic and offers little in the way of intensity. Stunt Cars feels like it's trying to do too many things at once and gives the game a very erratic feeling at times, making you wonder exactly what the developers were ultimately going for when they put the game together. Unless you just have to own every single racing game that comes out, you'd probably be far better off avoiding this rather lacklustre WiiWare racing effort. As difficult as you'd think it would be to mess up a racing game, the developers of Stunt Cars have somehow managed to do just that. Ouch. Very glad I held off on this until reading the review. It's not the only time you've saved me some points, Corbie. Thanks. What amazes me about this game was how they were brave enough to post a 4+ minute video of gameplay on the Nintendo Channel. Frankly, showing that much of the gameplay made it very clear that this wasn't a title worth buying... maybe showing less would've been wise? I wish that a good racing game would come out for WiiWare sometime in the future. It doesn't look hopeful though, unfortunately. I had high hopes for it but looks like just as you said corbie "Crash and Burn." Everything everywhere forever is better than Spogs. Man, it looked like it could be good, ah well. Im sure Moki Moki will be good too. Hey guys. I am the owner of Icon, the developer of Stunt Cars. Naturally I am biased, but I feel the review was too harsh. I'll give a free copy of Stunt Cars to the first 10 people who contact me, so that they can make up their own opinion about the game. This is for North America only. Just drop me an email, or leave a message on here. @RichIcon, I emailed you. Thank you! I will be willing to give my opinion....I will be willing to try this out and give my review of it.I am 33 have a 9 year old boy and 2 younger daughters so I would try and evaluate it from a broader stand point.Thanks I e-mailed you. I just watched some youtube videos of this. That certainly didn't look like a 3. I enjoyed the crashing particle system, and the tracks looked pretty good for WiiWare. I would take a free copy and I emailed Rich also. Rich, hello and welcome to Nintendo Life. While your offer is very generous, and will no doubt be siezed upon in short order, I'm not sure it will have the desired effect. Other developers of both positively and poorly reviewed games alike have opened a dialog with members here in the Forum section, and this is where hearts and minds are changed. I invite you to open a thread to discuss your title with current and potential customers. It will give you a valuable venue to receive both praise and constructive criticism which you may choose to apply toward your next effort. I wish you good luck with your sales, success on the WiiWare platform, and again, a warm welcome to Nintendo Life. I'm sure if you get a copy for free its not that bad of a game. The question is and I'm sure Corbie had this in mind when reviewing it is; is the game worth 800 points. How does it compare to other games in its price range? i know i'm no games developer, but as a games player. personally, i think that wiiware racers just need to have bare bones, stripped down, arcade style game play. the limitations of the files for downloads, i would hope that emphasis should be based more on gameplay, rather than how much content can be cramed into the tight file space. all i would like to see, is a wiiware racer with no silly waggle controls, about 10 or so well designed courses, a few varied cars, with different strengths and weaknesses, and a fairly good fraim rate. and a few extra downloadable cars and tracks if they want to expand out of the original file limits. oh, and a leader board for lap times. Hey guys - just checked my email and I'm up to 10. I watched the info video on the Nintendo Channel, and my thought is, "How could they get away with such jerky animation?!" If that video is actual game footage, this game's animation is so jerky, I wouldn't be surprised if it's capable of giving people seizures! Not a surprise, after watching its video on the NC last night (and almost fell asleep ), I could tell this game would get a low score, is very lackluster. Also, this racer seems a bit too generic for me, but then again so are GT, NFS and Forza, so I'm sure it'll have an audience. Oh god, that games looks SOOOO TERRIBLE! This game looks just as bad as those Data Design Interactive racing games! Just looking at some gameplay of Stunt Cars make me sick. Also, the graphics look really bad, allright not that bad by WiiWare standards, I would say the graphics are mediocre. Ill have to disagree, the graphics look very good for wiiware (don't give me examples of outstanding wiiware graphics) just look at the title picture. "Just looking at some gameplay of Stunt Cars make me sick. Also, the graphics look really bad." Can you elaborate on this? Explain the issues you have so we can better understand how it fails visually. @RichIcon: I was over exagerrating on that statement. The graphics don't look too bad for WiiWare, but they are not great either, probably I would say that the graphics look mediocre. Unless there's another Christopher R I never got a reply, was I supposed to send my Wii's number? Dings, you talking about the free copy of Stunt Cars? Patience. If there is a demo for this game in Europe next year i will give it a spin. I raced RC cars has a kid. So i can tell if your game is any good. 2) Why no online multiplayer mode?. 3) You have time trials which is great but you have no online leaderboards. 4) Is Icon Games a English or Irish Developer?. Thank you for your for time. Just to confirm - I've just sent out an email to the 10 listed about. Jerky Shop video - it would appear we messed up the NTSC video conversion. I have asked Nintendo if we can resubmit the video with the error corrected. People please stop making fun of this game before you try it. Atleast Rich has guts to comment on this thread. I give this game a 6.5 rating. You already gave it a shot, Ezekiel? I thought you said you were waiting on some points for xmas before you could download it. I'm waiting to try it out. 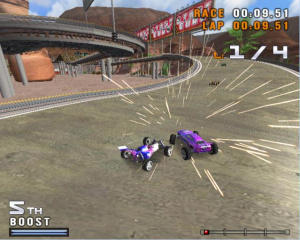 I bought SPOGS and played it a few times with my kids when it came out.I think to compare anything to SPOGS is pretty harsh unless you have played both already.I think SPOGS would have been better if they would have improved there menu (not real user friendly for younger audience).From the videos I've seen Stunt Cars has the appearance of a Hot Wheels game i use to have on my old PC so in a way I am looking forward to trying it out.My boy(9) watched the video with me and he commented on how he likes seeing the sparks fly. @theblacckdragon: Yeah but earlier I bought a Wii point Card and used a knife to remove the material to read the pin numbers but that made it unreadable so I called Nintendo for help. They told me to send the card to the address they gave me with my Wii ceral number and receat. Today I got my 2000pts and got Stunt Cars, Carnival King, and Magnetis. I endured the wait but now its over. Getting three wii point cards for Christmas. Ezekiel - I'd really like to hear your feedback if you fancy doing a post about it? Ever notice how many "mixed bags" are in WiiWare? @RichIcon: I have yet to play the game since racing games aren't really my thing, but I wanted to commend you for joining the discussion and being so friendly. I watched the video of the game on the Nintendo Channel with someone else and we were actually both surprised with how good the graphics were for a WiiWare release and we were wondering how you even fit all of that content into 40 MB. I wish your team and your games the best of luck. Thanks stratocastx; really appreciate that. Ok Rich Ill tell you good and bad things I like about Stunt Cars. Needs more cars to choose from, atleast 10. For next games think about online for games you think will benefit it and try to add something to a game that no one has before, for example, It would have been awesome to have music play from your sd card while playing the game. Those are my thoughts of Stunt Cars Thanks for this good game! Oh Rich can game developers view the surveys of thier game on Nintendo Channel? We're definately looking into online stuff - we'll be looking to take someone on to handle network code support early next year. "When Im off the track it puts me alot back"
Yeah - in hindsight we were perhaps a little too hard with the re-setting. Cars - we wanted more cars - the guy who modelled them actually modelled all the original Re-Volt cars, if you remember that game, he is a great guy. But time and resources were against us. Nintendo Channel - only from a US retail Wii I believe. I bought this game before I checked the reviews. Thought I'd see what everyone else was saying while my son has a play on it (he likes driving over the top of other cars in the monster truck). I think the game deserved much more than a 3, there's a lot of content and the graphics are good but I agree with Ezekiel in that the loading times are quite stretched (especially the initial one). Also when coming off the track on later levels you can fall behind but I found that pressing the minus button on the Wii remote does an instant reset so you don't have to wait. Very handy! On the whole definately better than some of the other WiiWare games I've downloaded for the same price. I got the game and have played it by myself and with my boy. 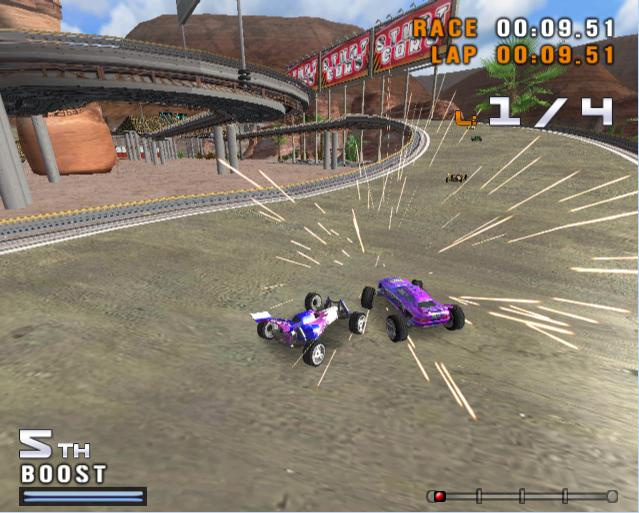 At first I could not keep car on the tracks and that became very frustrating. After a short while and realizing it works best for me with the nunchuk connected I finally got the hang of the controls and then was able to race. Graphics are very good for a wiiware game. Music simple, but has a catch tune that I keep playing in my head. Fun Challenging Tracks….I have been having fun seeing what track I get next and to watch out for holes that I could drop through,or where to much air time causes you to miss your turn. Things that could have been better…. It would be nice if when I went off the track that I would not have to start back from the beginning of a check point. But I do realize that that adds to the strategy of the game when playing in multi player mode. The controls where a little hard to get use to (It is nice that you can adjust some of the settings). The graphics where great but the road almost seemed to be to detailed to where it was almost distracting at first but then I got use to it. As far as for the long loading time...the very first time I went to play it it did take a long time to load..but since then it seems to load fine. Overall I have been enjoying playing this game with my son. I actually made the decision to revert to checkpoint - it used to restart you where you fell off. Doh! Roads - we used pretty high res textures all round, but I should have added a couple of texture variations in there. Next race game we do I'll make sure we put a ton of variation in the road texturing. Load times - this I think is down to the resolution of the textures - we went right up to the limit with the texture memory so there is a lot of data loading in. Ok Rich, after a few hours put into your game here is my feedback. I'll start with the good things that I personally liked, then I'll lay on the not so good things, or things I think you should improve on. Different "Times of Day", helps mix up the courses, though it should randomly change for the courses too. Adds replayability and uniqueness. The "Length" of the tracks is fine (They some are semi-short) because you have 6 tracks per cup. The amount of tracks is really good. The amount of cars/racers could be higher, but it's still a good variety. The graphics are average if not slightly higher than most wiiware games that are similar. Unlockables. Including them increases replayability and creates goals to work towards. Frame Rate Drops Frequently (Biggest Complaint) Racing games should not have lag. No Guard Rails/Boundries, or at least have them on some tracks. The Recovery Time from going of the track is fine/fast, but it probably shouldn't put you back a ways from the point you fell off. Some times it's fine, but a few cases it put me really far away. 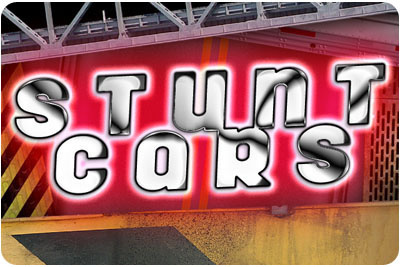 With a name like "Stunt Cars" their really are little to no stunts. Does getting "Air Time/Drift Time" do anything? There's only like 1 song I think that plays during all the races. It would have been nice to have more variety. Maybe add a speedometer of some sort? You can collide with enemies/damage yourself, but does it do anything? Like slow down, loss of stats? There should be some type of "Negative" effect when restarting races, or you could just keep doing it. Car physics seem a little dummed down, could have nicer flashier? slides, jumps, boosts. Braking seems very abrupt and no real friction/sliding. Why "4" Laps? Is it a happy medium between 3 and 5 laps that other racing games use. Better/More varied screen shots of each track would be nice, instead of the 4-5 shots used over and over again. Grade not precise, but somewhere around that which is given. Multi-Player: Didn't get a chance to play. I thought the game was decent, but not above other racing games that are already on WiiWare. I liked some things, but the frame rate issue is perhaps my biggest peeve. In a racing game that is supposed to be fast reflexes and arcade like, skipping/studdering frame rates are a big no no. I hope this really long post helps you and your team to making more and better games in the future. Online doesn't have to be in a game so you shouldn't ask why wasn't it in the game. Played for only a little bit because it's Christmas, but here's a quick review of my impressions. Unlockables: Something to strive for. Balanced cars: different cars for different gameplay. Pick the one which has the best feel. Control availability: Has Wii Remote only, Wii Remote and Nunchuck, and Wii Wheel functionality. Long learning curve for control: This game is playable when you get used to it, but it eliminates the pick-up-and-play element for playing a friend on multiplayer. They will throw down the controller in no time. 1st time off the track means you lost: you are set back so far you might as well start over because you will not catch up. Annoying on championship races. 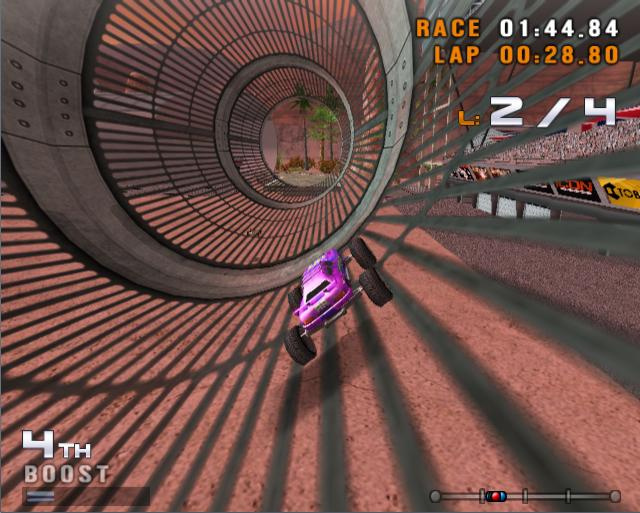 Sometimes has unsmooth gameplay: What Aronos described as a drop in frame rate is really annoying in a racing game where reaction time is a factor. Name: There are no stunts. I admit that I went into this hoping for an updated version of Broderbund's Stunts (or 4D sports Driving), but there are only just a few jumps. Basically we know we made a few mistakes with Stunt Cars; and we'll learn from that for the future. Let's hope their sequel is an improvement to this lame version. I registered here for the sole purpose of saying that this game is an unplayable pos. It's got some of the worst framerate issues that I've ever seen in a racing game. Anyone that says this game is anywhere near playable or gave it a rating above 3 should be pointed out and laughed at for being a ****.